This was a really good project because it combined charcoal with life- size figure drawing which are both tricky. 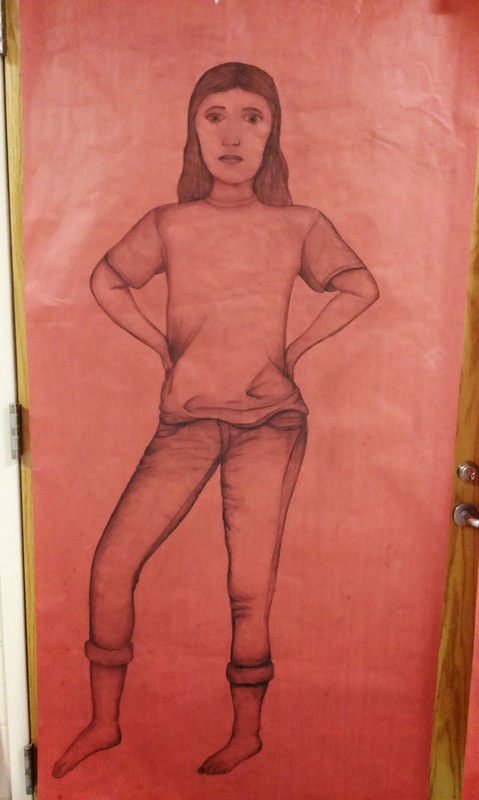 I have used charcoal on previous projects but I still enjoyed using it again and I liked how the project combined everything we have learned so far with folds, the face, and body proportions. This is original work because I drew my model by proper proportions and made sure to draw all the folds first and then started shading bit by bit. I saved the face for last and while I am not that happy with the face's proportions, I am pleased with the rest of the drawing. I drew the whole thing in pencil first making sure to get all the contour lines and folds from her t-shirt and jeans. I then went over the same lines lightly in charcoal, and followed those by shading. I was really happy with how I started with pencil because it allowed me to correct mistakes without it being noticeable before I finalized the lines in the darker charcoal medium.